This traditional Savoyard Chalet offers self catered accommodation for up to 8 people to a high standard. There is space in the living room for lazing in front of the wood-burning stove. A large kitchen makes catering easy & the open plan layout means that the cook(s) are not excluded from the social banter. Chalet Dow makes a great summer base as well. SKI SCHOOL: If you require skiing lessons we can recommend The British Alpine Ski School in Chatel. Peter Kuwall provide lessons from beginner to Instructor training, off piste and mountain skill courses, private lessons and groups of a maximum of 6. All age groups from 3 years and upwards are catered for. ACCESS TO LIFTS: The nearest lift is La Panthiaz lift in La Chapelle d'Abondance only 700m from the chalet. There is a lift from the centre of Chatel which takes you into the Petit Chatel skiing area and two further lift stations at La Linga (4 km) and Pre-La-Joux (6km) both of which link directly into the Portes du Soleil and have large car parks. There is a bus that stops at the end of the road (La Pesse) to both La Panthiaz and La Linga lifts. The bus timetable and piste maps can be found on the Chatel website. The chalet was ideal for our party of seven; well laid out, clean, comfortable, warm and practical. Although we visited for the snow, it would be equally good for a summer holiday. The views of the mountains are spectacular! In the main living room is a couple of leather sofas in front of the log fire with a large table in the kitchen area - perfect for family meals and games. Outside is a furnished veranda and patio. The chalet is a mile or two from Chatel and, although there is a bus service nearby, it is probably easier to reach the town and slopes by car. Chatel itself was very lively in the evenings with many restaurants and bars. The Intermarche supermarket is within walking distance from the chalet. We would thoroughly recommend a stay here! Fantastic location with easy access to all of the local ski areas. 5 min drive to local bars and restaurants. We are really glad you enjoyed your stay and look forward to welcoming you back next year! Good time visitng daughter who came to La Chapelle in 2008 but never left. Beautiful village with good facilities, restuarnts and bars. Excellent for trekking, walking, climbing, mountain biking etc. in the summer and skiing in the winter. 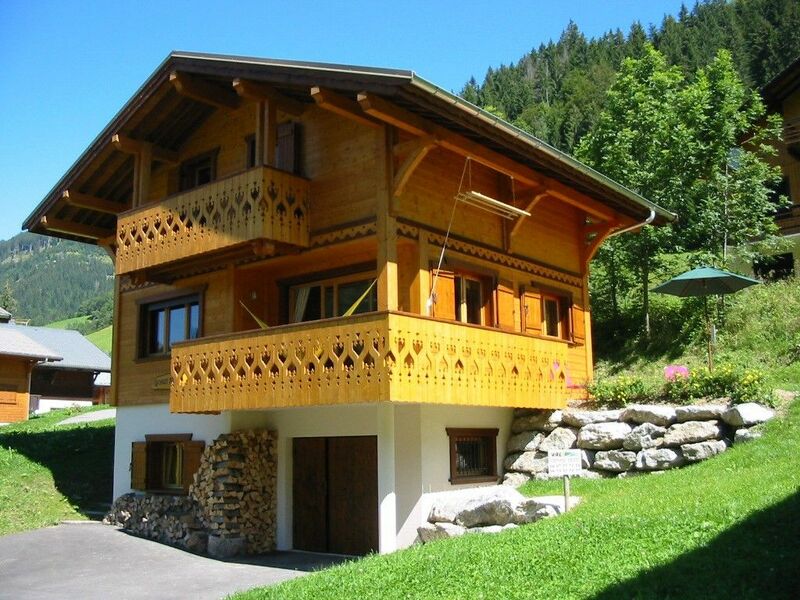 Chalet Dow is well located for families, clean and has all the necessities. Chalet Dow is warm and cosy, we never felt crowded even with a full house of 8. The living area was spacious with beautiful views across the valley and the mountains beyond. We had a fantastic family trip and the chalet provided all we needed. Everyone has vowed to return. Thank you for sharing your wonderful home in the Alps. With the centre of Chatel only 3kms & the furthest of the 2 lifts that connect to the Portes du Soleil only a 15 minute drive from Chalet Dow, you will be well placed to enjoy any of over 650kms of pistes. Along with this is a well organised ski school for all abilities; lots of choice for ski hire & a roaring après ski scene that will finish off those with too much energy at the end of the day on the slopes! In the SUMMER months there is plenty to keep you occupied from white water rafting and other river activities, climbing, mountain biking, walking, and paragliding to visting the brand new aquatic centre - Forme d'O in Chatel and swimming from one of the many 'beaches' on the shores of Lake Geneva at Thonon-Les-Bains or Evian.